Join us for a delicious four course meal and delight in the wonder of turning Friday night into Shabbat. Rivky's amazing food, thought provoking discussions, and the best people in town combine to create a soul restoring, happiness inducing experience. Shabbat shalom - come and bring a friend! Check the Facebook group for the next FNL @ Chabad. 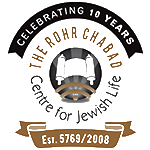 Click here for an illuminating study on the effects of spending Shabbat with Chabad.